Back to school, back to activities, and back to sports! These can be super busy times for families everywhere and sometimes, it seems like you live and eat in your car. It can seem impossible to get a nice meal on the table, for your family, when you have so much going on. Well, here are some quick sports night meal ideas that you can get on the table, even on your busiest night! One Pan/Pot Dinners are always a winner on busy nights. One Pot Pasta Dinner from Crystal and Co.
30 Minute Chicken Stir-fry from Crystal and Co.
Related: 25 more sports night dinner ideas! Pizza is always a quick and easy dinner option! Easy BBQ Chicken Pizza from Crystal and Co.
How about something quick ‘n’ easy, straight from the oven? You could also go for some pasta perfection! Set up dinner in the crock pot before you start your day. Crockpot Mediterranean Chicken from Crystal and Co.
You can also throw dinner on the grill once you get home. And if all else fails, nothing beats a grilled cheese sandwich or Sloppy Joes! The Best Grilled Cheese Sandwich from Crystal and Co.
Want more sports night recipes? 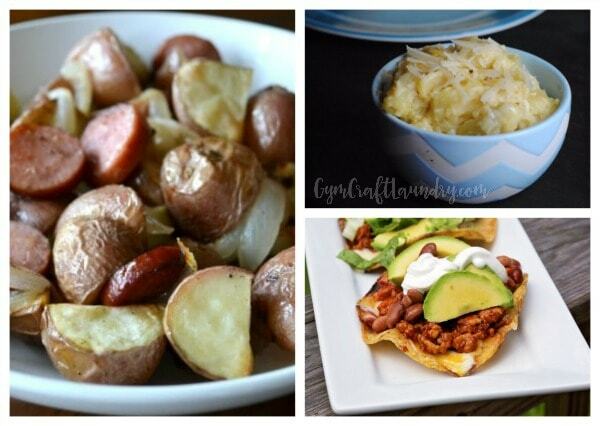 Check these slow cooker recipes out! Love this!! We aren’t even old enough for sports yet but there’s piano lessons, dance, library activities, kinder-music and the list goes on. Not to mention meetings for myself and my husband. Every night seems to be crazy. This is such a great list of easy meals because I seriously doubt my budget can handle any more take-out! Oh my gosh. We don’t have sports nights yet, but these for sure work with crazy 2 and 6 year old nights!!! I’m excited to try some. This is a good list! Time is always scarce on weeknights even without sports to worry about. We aren’t back for a little while in NY but this post is a great reference for any busy mom. Love it!